I want to be a good human being. I want God to know that I have been a good human being. I want to go to heaven. So selfish am I that this is the reason why I want to be a good human being. So that I can go to heaven and meet Rafi Sahab. If there is any regret that I have in my life as of now, it is that I haven’t been able to meet Rafi Sahab in flesh and blood, that I haven’t been able to touch his feet, seek his blessings and see him smile his trademark smile, and sing for me even one little song from the veritable treasure that he accumulated but happily left behind for us. And I want to listen to his stories. No, Rafi Sahab was never a great story teller if you want compare him with people who talk beautifully, explain in great detail, and punctuate their tales with great articulation. He was a great story teller when he sang. Each song of his was a great story, and each song of his gave us a lesson, a moral, a thought, an expression, a way of life and of course the sheer desire to live. Are you surprised when I say this? Ok, so let me begin by asking you all- do you remember the two beautiful songs among so many that he sang for little kids? I grew up listening to one of them, and later as a young teenager learnt the other. Chum Chum karti aayi chidiya, daal ka daana laayi chidiya……Wasn’t that a beautiful story? And what about Sunlo Sunaata Hoon Tumko Kahaani ….re ma ma re ma ma re….! stories indeed. Lovely stories that we loved to hear as kids, and learn from too! Rafi Sahab never possessed a powerful voice when he spoke. He spoke ever so softly. He almost whispered apologetically. Even his own children say that. But when he sang, the voice boomed, the voice conquered, the voice told everyone- now listen to this. There is something in this song for you. I grew up learning about India of the ancient days from his story Jahan Daal Daal par Soney ki Chidiyaan karati hai Basera, Wo Bharat Desh Hai Mera. The story he sang matched perfectly with what I had read in my History books in school and college, but he told it so nicely, so warmly and so proudly. Listen to his songs of patriotism like Kar Chale Hum Fida Jaan O Tan Saathiyon, Ab Tumhare Hawaale Watan Saathiyon. The story reverberates even today, 50 years after its recording. It gives you goosebumps, it makes you nostalgic. It makes you want to throw any evil doer out of your country. And then the song laden with pathos, that of a heartbroken young song soldier, who misses his lady love by lamenting Main Yeh Sochkar Uske Dar Se Utha Tha…..Yahan Tak Ke Ussey Juda Ho Gaya Main. You can feel the hurt, the longing, the yearning. You want to console the forlorn soldier at the front. You want to tell him, there will be another day, another person waiting for you, in the same way as Rafi Sahab himself imagined with Masti Mein Chhed Ke Taraana Koi Dil Ka, where he says Aage Badhegi Magar Ruk Jaayegi, so fondly so lovingly , so much in anticipation. Rafi Sahab brings back hope into despair, smile into hurt and joy into sorrow. His romantic songs were all stories. Ek Khoobsoorat Ladki Mujhe Raat Ko Mili Thi is absolutely delightful in telling us the joyous and heartwarming feeling the young man is going through at that time. Just as Tum Jo Mil Gaye Ho is the story of a perfectly delighted person who has found an oasis in the desert, and greenery among the desolate landscape. Narration of great stories like Kahaaniyaan Sunaata Hai Pawan Aati Jaati, Ek Tha Diya Ek Baati, where the trials and tribulations of not just a person but a race, a community comes across with great feeling and pathos. You can’t help marvel at the story telling ability of Rafi Sahab. I know you are going to say at this point that story telling is the work of the lyricist. But you will equally quickly agree with me that nobody could have told the stories better than this great man himself. Because when he narrates the story, he undergoes the same feeling, the same emotions and expresses them in each word, in each syllable. Akela Hoon Main is Duniya Mein is the story of a carefree young man who doesn’t mind his solitude and in stark contrast is the story of the loner, the loser, the defeated young man who bemoans his feeling of loss in Saathi Na Koi Manzil Diya Hai Na Koi Mehfil.. The vanquished and down and out election candidate for the student union gives us the heart wrenching Swapne Jhare Phool Se …..Kaarvaan Guzar gaya ghubaar dekhte rahe. Our heart goes out to the man who has lost everything , not just the votes but also his lady love, whom he forsakes to go all out to win votes. The heartbroken lover’s story comes out in Kya Hua Tera Waada, where he asks Yaad hai mujhko tune kaha tha….you can truly feel and share his loss. Yearning for love, looking out for someone special and crooning away in the hope that a pretty face would smile at him, the hero sings Pukaarta Chala Hoon Main, and that is a lovely story indeed. Specially when he says Suni Mere sada to Kis Yakeen se…….! The story teller in Rafi Sahab wins our hearts with Main Gaoon Tum So Jaao where he narrates to the little kids the story of life, the story of hope and the story of a better tomorrow. The story lulls you into the deep slumber that kids enjoy. Another story of a city gone to sleep with the hope that tomorrow will be a better day is Aaj kal mein dhal gaya din hua tamaam…..
Ek Banjaara gaye jeevan ke geet sunaaye is another story of hope and bright days, and living a life dedicated to the happiness of others. In stark contrast is the lament of the guide gone wrong with Kya se Kya Ho gaya bewafa tere pyaar mein. The two stories come out with extraordinary clarity, with Rafi Sahab displaying his special understanding of moods. If Ek tha Gul aur Ek Thi Bulbul is not a story then what is it? The same applies for Ek Daal par Totah Boley Ek daal par Maina. Both songs are full of life, both songs have great stories to tell. One clearly identifies Rafi Sahab as a story teller par excellence when he recounts his chance encounter with a beautiful lady on a rainy evening with the evergreen Zindagi Bhar Nahi Bhoolegi Wo Barsaat ki Raat. No story was more beautifully told, so lovingly expressed. You can actually visualize someone as pretty as Madhubala in every person’s story and song. The lovelorn young man tells his story when he waits impatiently for his beloved to come, with Aaj ki Raat badi shokh badi natkhat hai, aaj toh tere bina need nahi aayegi. And I cannot help mentioning my all- time favourite song Main Zindagi Ka Saath Nibhaata Chala Gaya, the story of a lover turned soldier turned philosopher who says his story of going with the tide and living a life of no regret or sorrow. I don’t live with my sorrows, was how Dev Saab told his story. Rafi Sahab just tuned it more beautifully for him. Now, friends, I am sure you all agree with me, in unison, that Rafi Sahab was indeed the greatest story teller of all times. And that is why I want to go to heaven. And that is why I want to be a good man. Because I so much want to hear all those stories again, personally sung for me, under a huge tree, with the stars and with the moon and with the sonorous voice of Rafi Sahab that will give me the greatest happiness of all times. I have no other wish in life. I want to thank my good friend and brother in law Dakshesh Shah for giving me this thought about the story teller. It was Dakshesh who brought out this point to me when we met the other day in Ahmedabad. Happy 88th Birthday to You, Rafi Sahab. Looking forward to meeting you up there. This entry was posted on Monday, December 24th, 2012 at 7:05 am	and is filed under Meri Awaaz Suno. You can follow any responses to this entry through the RSS 2.0 feed. You can leave a response, or trackback from your own site. Am Fan on Mohammed Rafi since the day I developed my senses for the music .. I never miss a single “Hmmmm” or a “sur” he sung .. Have got a lots of his song in my library … If possible, I would share with you someday ..
“I know you are going to say at this point that story telling is the work of the lyricist. ” Just imagine the song ” Ek tha gul aur ek this bul bul” which you have also mentioned being sung by anyone else. Great lyrics and equally great composition, but would this song had become immortal without Rafi sahab’s masterly rendering. Just listen to the part: Phir ek din ki baat kahoon mein; ek sayyad chaman mein aaya..le gaya woh bul bul ko pakadke aur deewana gul murjhaya, aur deewana gul murjhaya”. The way he had conveyed the pathos in this part is typical of Rafi sahab. He goes into the soul of the song ..and that is why his songs enter into our soul. One more masterpiece that comes to mind is ” Na kisi ki aankh ka noor hoon” -lyrics by the last Mughal Emperor -Bahadur Shah Zafar(composed by S.N Tripathi) , which was immortalised by the Emperor of Playback singing: Rafi sahab. Can anyone even come near to him in this song-which was absolutely without any music–ONLY PURE 24 CARAT GOLDEN VOICE OF THE MAESTRO. Wishing all Rafi fans a very happy new year. dear sir well written article. i have the same wish as you have. i also want to meet my god who taught us the lesson of humanity, charity, kindness, politeness and etc……. rafi saab’s songs are our life. happy birthday to you rafi saab the legend of legends. 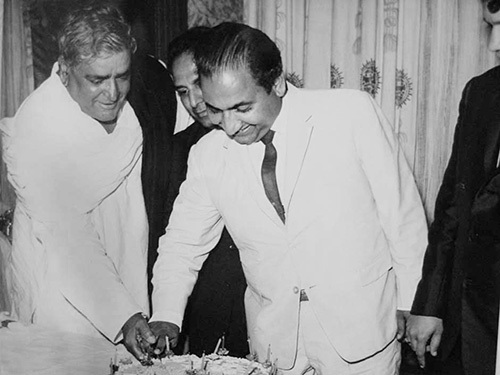 Love and greetings to all our mohd rafi saaheb lovers on his grand 88th birthday…. you have enriched my (our) life with your voice for the past many years and will continue to do so till out last breath. wherever you are, please accept my (our) heartiest birthday greetings. many many happy returns of this beautiful day, whn God bring you in our life. you r the only a Legendary and you are the only. “aap hamesha hamari aakhri saans tak hamaari saanso mein base ho. is sangeet ki duniya ke shahansha is duniya se hoke door jane kis khubsoorat jahan mein base ho! This is the most exquisite piece of write-up dedicated to one and only Mohammed Rafi saab on his 88th birth anniversary. You have brought out a facet of Rafi saab’s singing, which was always there, always heard and felt but remained unexplored. Your style of narration is simply superb. Hats off to you. Happy birthday to our beloved Rafi Saheb. saab and we did not know how suddenly the time passed. i believe rafi saab is the number one wonder of the world. Mumbai rocked with Rafi saab songs. At our event, Biswajit was awarded the mohd rafi award and he presented/sang two numbers Pukarta chala hun mai and Nazar na lag jaaye to a standing ovation at bandras Rangsharada auditorium. thankyou rafi saaheb and his innumerable fans – from the rafi foundation…. I realised at about 9.00 pm that it was Rafi Sahab’s birthday ! Remembered it yesterday but since I was busy in travel today, it just about skipped my mind until 9.00 pm. And then I had some misgivings. Wondered if I had sung any particular song of his today to myself… then realised that in fact in the morning I had sung a lot and as usual most were his songs. I even sent up a silent thankyou to GOD that he gave us Rafi who immortalised such songs and packaged them as wonderful gifts for us to bask in ! And all this without actually focusing that it was his birthday today ! But then I always send up my silent thanks whenever I hear or recall and sing to myself these wonderful gems! Happy Birthday to a singer like never before, the great Rafi Sahab whom I admire the most, an absolute genius he was, a man with the Golden voice, a down to earth person, a kind person, always first to help the needy. No one will be like you ever, PROUD TO BE A RAFIAN! beautifully written tribute on the birth anniversary of our departed farishta. indeed he was a storyteller par excellance. you have to closely view his songs to understand his super talent. now watch the ‘dil apna aur preet parayi’ song ‘jane kahan gayi’ which is a fast-paced song picturised alternately on a group of street singers dancing and singing on the beach and the hero raaj kumar sitting in a melancholy mood after the sudden departure of meena kumari. look carefully the difference in the tone when the camera is on the street singers and the sad raaj kumar. such subtle changes were only made by the unparralleled talent of rafisahab. it is true that rafi saheb can sing in different moods whether it is for children, lovers, elders or soldier. the talent he shown at every steps itself recognize him a versatile and universal singer. it is very proud that rafi saheb gave us a number of lovely songs which will rejuvenate and enjoy us for ever. on the occasion of 88th grand birth day of our great singer rafi saheb, i wish u all good health, happy and prosperous life. Happy Birthday to GREAT RAFI SAHAB (SINGER OF THE MILLEINIUM). I am unfortunate that I had not get a chance to meet RAFI SAHAB but My Father is also a great admirer of RAFI SAHAB and he got a chance to see the live performance of RAFI SAHAB in Bareilly. RAFI SAHAB is the second member other than my family whom I like and admire the most in the whole universe. I dedicate my sole towards the voice of Late Janab Mohd. Rafi Sahab. People say that he has dead but I think such a very good man never die. He is alive in my heart and my soul. HAPPY BIRTHDAY TO THE GREATEST SHAHENSHAH of MOUSIKI AND TARANNUM. SIR ,YOU WILL ALWAYS BE THERE IN OUR HEARTS THROUGH YOUR SONGS. what one can say about Mohd Rafi? no words…..
You have enriched my life with your voice for the past 50 years and will continue to do so till my last breath. Wherever you are, please accept my heartiest birthday greetings. rangajee – your first two para’s well taken – cause it is about the avathaar. i loved your style of presentation – typically ranga magic as i have seen it. beyond these two para’s i for one do not need to refer his songs to understand him or his message. he was singing god – just listening to his varied songs is in itself a process of learning. he was a university all by himself. i have seen him and heard him at ” matheran ” ( near mumbai ) hill station and he sang there all for free – cause – he used to do that annually – being invited. i was a small chap then – my parents had taken me there. had not known the greatness of this avathaar then. let rafi sahab give greater strength to your pen. the magic wll never stop. from the rafi foundation, mumbai. « Happy Birthday Dear Saheb. You will always be with us.